"I couldn't help it. It just popped in there." "It's the Stay Puft Marshmallow Man." Oh Ray, you fool. How could you? The Stay Puft Marshmallow Man? Why couldn't Ray have thought of absolutely nothing like everyone else did? But he didn't do that, did he? So now, there's a giant Stay Puft Marshmallow Man attacking New York City. Sure, it's probably the fluffiest thing to ever attack the city, and marshmallows seem pretty harmless, but obviously none of us have ever dealt with an angry marshmallow thirty stories tall. Somehow, despite technically being an evil character in Ghostbusters, Mr. Stay Puft Marshmallow Man is universally beloved. You can't help it. Everybody enjoys a big plump marshmallow man. And his sailor suit is simply too cute. You might be trying to remember the Stay Puft Marshmallow Man from your childhood, thinking "Oh yeah, I remember that brand. We used to roast those marshmallows while staying at Camp Waconda as a kid. It's all coming back to me." Well, your memory is playing tricks on you, because the Stay Puft Marshmallow Man is actually fictional, created specifically for Ghostbusters. Can you believe that? Don't you just wish they were real now, so you could roast a warm, soft delicious marshmallow while your favorite mascot looks on? Alas, it isn't meant to be. 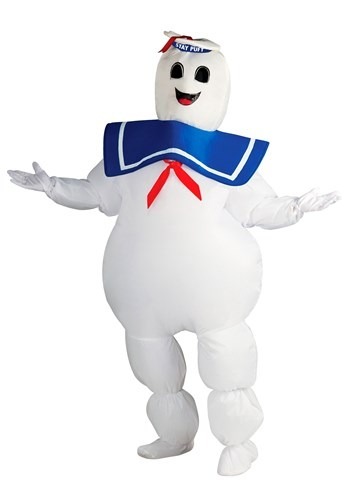 But, you can bring the jolly white giant to life with this Stay Puft Marshmallow Man costume. You won't just delight yourself as you happily wreak havoc in New York City, you'll delight everyone, because there's nobody who doesn't enjoy the iconic image from Ghostbusters. Just don't let a bunch of guys wearing proton packs cross the streams on you. That's gonna be a bad time. Plus JACKET SIZE Up to 52" Up to 52"